If you are planning to buy some KraftMaid cabinets, you must be sure that you know what you are choosing. Those cabinets are not only of high quality, but they cost more than the average cabinet that you might see in department stores. So to make sure that you are buying wisely, here are some tips from me. Remember that you must put in mind the function, design, and additional features of a cabinet when buying one. The best way to ensure that you are getting the most suitable cabinet for your house, you must know about its three types; Stock/Production, Semi-Custom, and Full-Custom. The quality of this type of cabinet varies. Since it is custom built, the designs do not have any limitation. However, many cabinetmakers that build this kind of cabinet do not usually have the necessary tools and equipment. Because of that, they cannot apply any advanced techniques for the accessories and finishes of the cabinets they produce. Due to that circumstance, the best option you have is to get a cabinet like that from KraftMaid. Though, it is a fact that this kind of cabinet is the most expensive. Also, if you want to receive a full custom built cabinet from KraftMaid, you will need to wait for six to ten weeks before you get one. Compared to the full custom built cabinets, this type are faster and less expensive to make. It is possible that you will get a cabinet like this within four to six weeks. If you get a semi-custom built cabinets from KraftMaid, you can choose from 200 storage solutions, 100 styles of doors, and 65 different finishes. The combinations of those options are virtually unlimited. Because of that, getting a semi-custom built cabinet is a better decision than wasting time and money with full custom built ones. If you are in a hurry, it is greatly advisable to buy a stock cabinet instead. In addition, this is the least expensive choice when buying a cabinet. 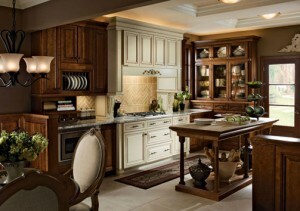 However, cabinets under this category greatly suffer from its design limitation. Nevertheless, it is better to browse for stock cabinets first before deciding on getting a full custom or semi-custom one. And it is a good thing that KraftMaid’s stock cabinets are good on its own. 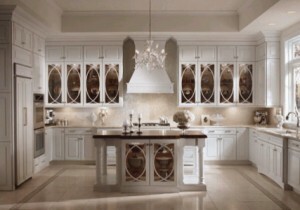 Most of their production cabinets are designed to be suitable in different house styles. There are some other aspects you can consider when buying a cabinet. One of them is the wood material used in creating the cabinet. You must know if the type, color, and grain of the wood of the cabinet you will buy will be aesthetically compatible with your house’s design. Moreover, you must also consider the finishing technique that was used on the cabinet you will choose. KraftMaid offers a variety of finishing styles. A few of them are burnished, highlighted, painted, painted with glaze, stained, and stained with glaze. The things I have mentioned here are a few that you should consider when buying a cabinet. Make sure that you meticulously inspect every cabinet you will see, and I assure you that the KraftMaid cabinets you will choose will be worth your money. This entry was posted in Bath Vanity, Cabinet Manufacturers, Kitchen Pantries, Kraftmaid Outlet, Modern Kitchen, Semi Custom Cabinets and tagged Bath Vanity, Cabinet Manufacturers, Kitchen Pantries, Kraftmaid Outlet, Modern Kitchen, Semi Custom Cabinets. Bookmark the permalink.